To set up a filter, begin by logging into your Gmail account. Click the “Settings” link in the top right corner of the screen. 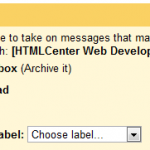 Type in the search criteria you want to apply to your filter (for instance, to catch all messages from the HTMLCenter blog, you could type “[HTMLCenter Web Development Blog]” into the “Has the words” box). My inbox has started to get cluttered so thanks for this, will be helpful. This information is very helpful. Yes, we want our emails to be organized especially when we get a lot of it from different people in different organizations or companies that you are involved with. Not only can we save time in looking for the specific emails that we need, we will also save time from opening messages that we don’t need. Also, the social networking sites are very great means of gathering information in just about everything.